It is recommended to use a supported operating system to connect to the Chapman network. Microsoft currently supports Windows 7, 8, and 10. Apple supports OS/X and El Capitan. Keep your computer up to date by installing the latest critical security patches. You can download security patches at no cost. Keep the anti-virus and anti-spyware data definition files up to date. Chapman provides antivirus software for all students who need it. Every residence hall room will be equipped with both 2 voice (telephones) and 2 data (Ethernet) jacks in rooms with 2 occupants or 1 voice and 3 data in rooms with 3 occupants. 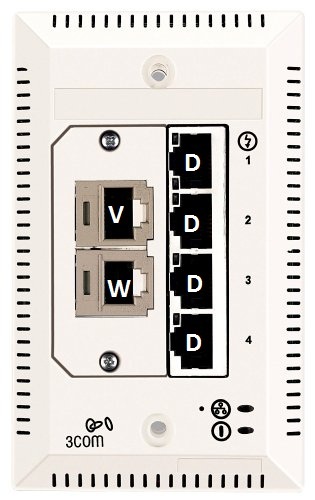 In rooms with 2 occupants, the top 2 ports are for voice and the bottom 2 ports are for data. 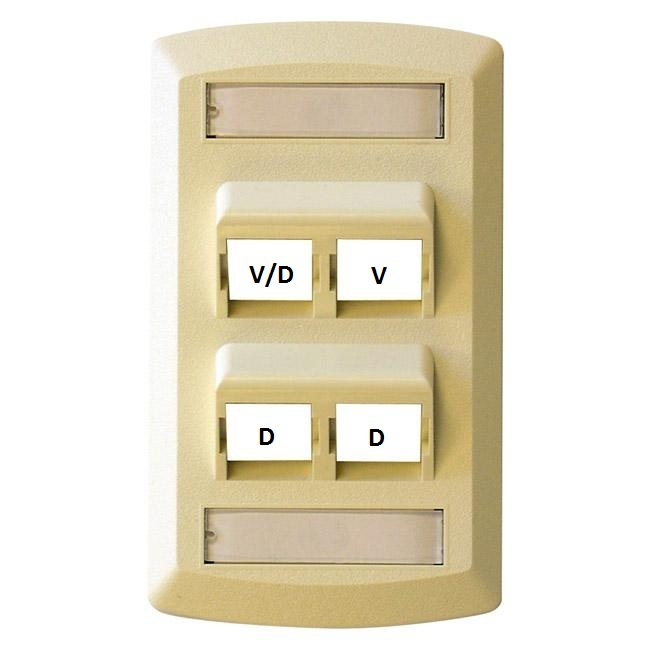 In rooms with 3 occupants, the top right port is for voice and the top left and bottom 2 ports are for data. The voice cable is a standard phone connection or a RJ-11 cable. The data port uses an Ethernet or RJ-45 cable. The 2 types of face plates you will find in your room are shown below. When connected, there should be blinking lights on your computer at the Ethernet port. There are many factors that can affect the performance of your computer on the residential network. Please follow this checklist to make sure your computer is configured for optimal performance. Make sure your computer is not infected with a virus and the antivirus software is updated with the latest anti-virus data files. Check to see if your computer is infected with spyware. Spyware is the most common cause of poor network performance on the residential network. You should download and install one or more anti-spyware programs and run them frequently to remove spyware infections from your computer. For the best performance on Chapman's network, you should use an Ethernet cable which can be purchased at Chapman's bookstore or any electronic store. Most of the rooms and public areas of Chapman's residence halls are covered by the campus wireless 802.11 b/g network. Your computer must be configured properly in order to access the Chapman wireless network. Please contact the Service Desk for assistance with configuring your computer for connecting to the Chapman wireless network. Personally owned firewall/router devices. Many students bring their own firewall/routers to campus. These routers can become "rogue" DHCP servers and can give invalid IP addresses to other student computers – preventing the other student computers from accessing the Internet. These "rogue" devices will interfere with Chapman students trying to connect to Chapman’s wireless network. Chapman does not allow personally owned firewall/routers to be used on the network. Students are subject to disciplinary action by the Student Conduct Committee if they violate the policy of installing personal firewall/routers. Personally owned wireless access nodes. Many students bring their own wireless access nodes to campus and connect them to our wired network. These "rogue" wireless access nodes prevent other students from connecting to the Chapman network. If you are having trouble connecting to Chapman’s wireless network, please call the Service Desk at (714) 997-6600. Students are subject to disciplinary action by the Student Conduct Committee if they violate the policy of installing personal access points and personal gateways. Personally owned wireless printers. Wireless printers act as "rogue" wireless access nodes which prevent other students from connecting to the Chapman network. Also, a wireless printer will allow any student to be able to use your printer during anytime of the day. To use any printer in your room, you need to buy a USB cable and connect the printer to your computer via USB. Bridged network interfaces. Some students have, perhaps by accident, configured their computers to bridge the Ethernet and wireless interfaces on their computers. This interferes with connectivity. If you use the wireless interface on your computer please make user that it is not bridged with the Ethernet interface. 2.4 GHz cordless phones. The wireless 802.11b/g network operates at 2.4 GHz. Cordless phones that also operate at 2.4 GHz can cause interference with wireless network signals. Older cordless phones that operate at 900 MHz and newer cordless phones that operate at 5.8 GHz do not interfere with the wireless data network. 900 MHz and 5.8 GHz cordless phones are permitted but 2.4GHz cordless phones are prohibited in the residence halls because they can interfere with the wireless network. Microwave Ovens. These ovens also operate at 2.4 GHz and can interfere with wireless network signals. Microwave ovens are prohibited except for the ones in the "micro fridge" units that you can rent from the Housing Office.